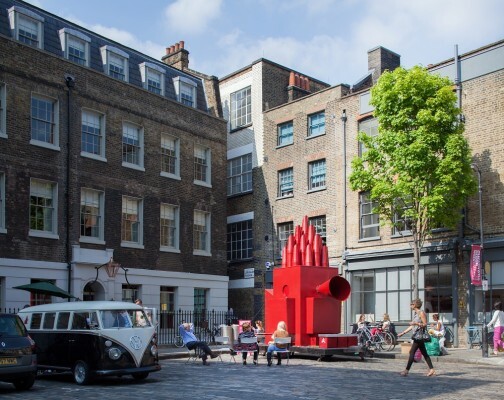 London Festival of Architecture Installations 2016 – Architecture creates spaces for people to gather, socialise and communicate with each other. Does it have the power to involve people in active rather than passive experiences? Earlier this year, the Royal Institute of British Architects (RIBA) issued an open call, inviting ideas from its architect and student members that could create or encourage community activity. From 21 June until 4 August three of the open call submissions will transform into ambitious 1:1 installations, displayed outside and throughout the RIBA’s Art Deco landmark building at 66 Portland Place for the Institute’s summer showcase. The three installations at 66 Portland Place have been designed by teams from Feilden Clegg Bradley Studios, Erect Architecture, and MARGIN, a group of former students from Liverpool. RIBA is delighted to showcase these projects that have found new ways for architecture to ‘construct communities’ through creating spaces for newly arrived refugees to interact with existing communities, making the everyday event of disposing rubbish a sociable and playful experience and a soup kitchen that raises public awareness about London’s air quality. The installations will be on show outside the front of the building, on the first floor and on the fourth floor terrace. The research and development behind each of the three ideas will be exhibited in RIBA’s Practice Space gallery. The installations will be launched on Tuesday 21 June as part of a Late Tuesday event with a series of talks, debates, forums, and virtual reality presented by the sponsors, Cityscape Digital. 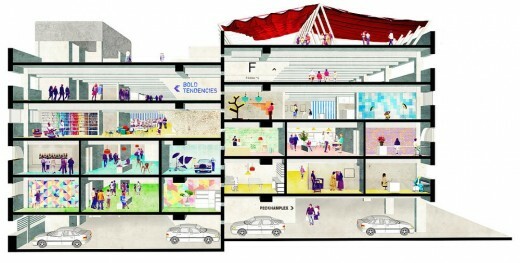 Moving from W1 to Peckham, an exhibition of nineteen responses to the open call will be presented at Peckham Levels, the reinvention of a multi-storey car park in south London from 2 – 30 June. The projects demonstrate the diverse approaches by RIBA members to the brief of how architecture can influence or create communities. The variety of projects on display will include ideas for a Peckham Coal Line project, alternative approaches to engaging with democracy, and an app that joins people up with unused spaces in the city. The featured projects are by: BAT Studio, CAT2, De Rosee Sa, DH Liberty, Erect Architecture, Esther Frimpong + Zena Moore, Feilden Clegg Bradley Studios, George King Architects, MARGIN, MESH Workshop, Mobile Studio Architects x Piper Haywood, MSMR, Nancy Jackson, NG Architects, Noor + Mills, YOU + PEA, Tate Harmer, The Village, Weston Williamson. Sponsors of the Open Call, Cityscape Digital, will present projects in digital form using some of the latest VR headsets including the HTC Vive and Oculus Rift, and on-screen at the Late Tuesday event, 21 June at RIBA’s 66 Portland Place. Sponsors of the Late Tuesday event, Blurb Books, will present a talk ‘From Bricks to Books’ by Anthony Hoete, Director of WHAT_ architecture. 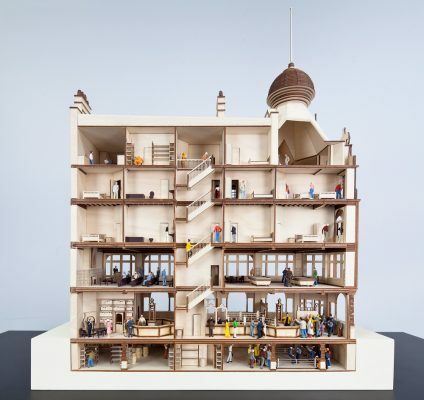 RIBA Members, from students through to Chartered Practices, regardless of size or location, had been invited earlier in 2016 to submit designs for the Royal Institute of British Architects’ (RIBA) summer installation ‘Constructing Communities’. During summer 2016, the RIBA has given RIBA Members, both practising architects and students, an opportunity to display their ideas and work across London between Peckham Levels and the RIBA headquarters at 66 Portland Place. Responding to the London Festival of Architecture theme of ‘Community’ the RIBA is exhibiting projects that take a fresh look at how architectural structures, both permanent and temporary, can strengthen community engagement, from micro to macro scales. Work represents a variety of community ideals such as alternative housing arrangements, new co-working or co-habitating setups, mobile enterprises, or public spaces. The RIBA had sought original projects that explore technical innovation, potential to instigate change, and the ways in which communities can be constructed with architecture. Experimentation and imaginative thinking were encouraged for the works submitted to the open call. A shortlist is presented in 2D, 3D or time-based media visualisations at Peckham Levels in south London – the iconic car park site well known for hosting Bold Tendencies and Frank’s Campari Bar. Three winning entrants will be invited to construct their project at a 1:1 scale for installation at the RIBA, 66 Portland Place. These installations, and their development process, will be exhibited across RIBA. This will be shown in parallel to the summer exhibition in the Architecture Gallery, ‘At Home in Britain: Designing the House of Tomorrow.’ (opens 18 May). The practices selected to build 1:1 structures will be working with the RIBA Young People’s Forum (16-24) to develop and build the 1:1 installations. These installations will launch on the RIBA Late Tuesday on 21st June, an event which regularly draws over 1,000 people. The exhibition has been designed by Rachael Davidson (HÛT Architecture) and Chris Bryant (Alma-nac). The shortlist exhibition at Peckham Levels is on display throughout the London Festival of Architecture, 1st-30th June.